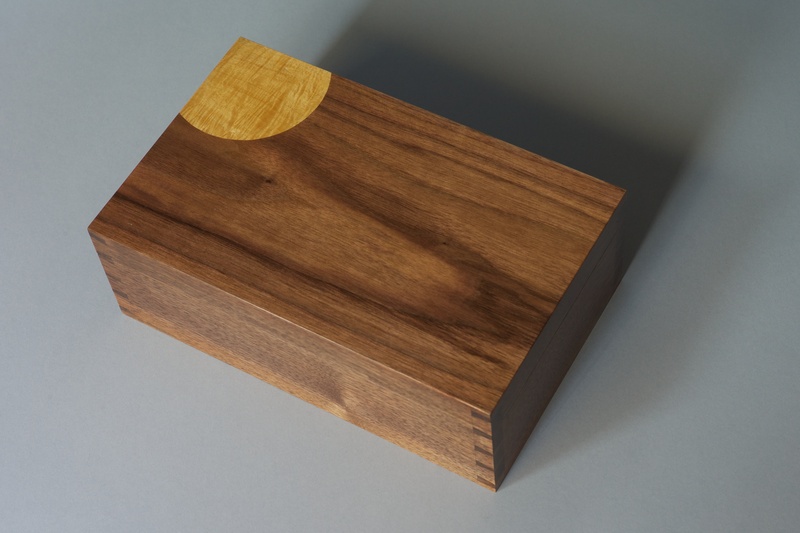 Here are some images of my first finished piece - A jewellery box in the deepest rich walnut with an ivory wood inlay. This was given as a Christmas gift to my dear Karen and it sits proudly in the bedroom growing deeper in colour by the day. 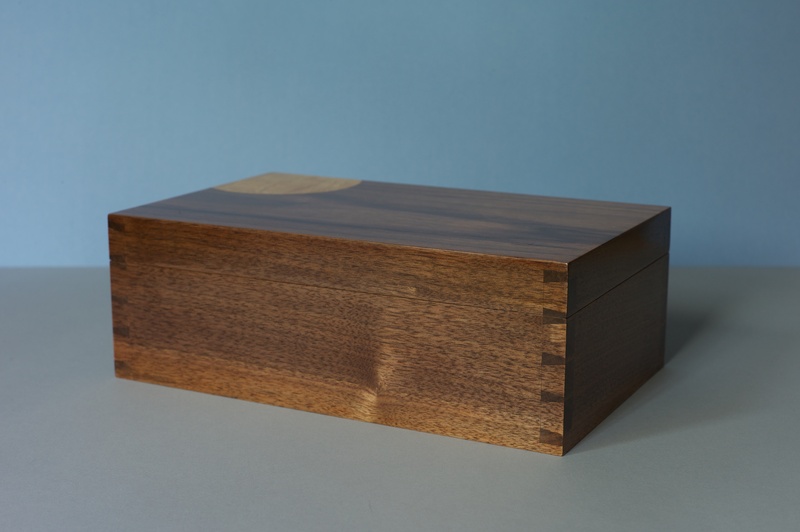 The box is a culmination of the first terms efforts, from picking up the hand tool for the first time to the seemingly endless hours polishing veneered boards to get the feel 'just right'. 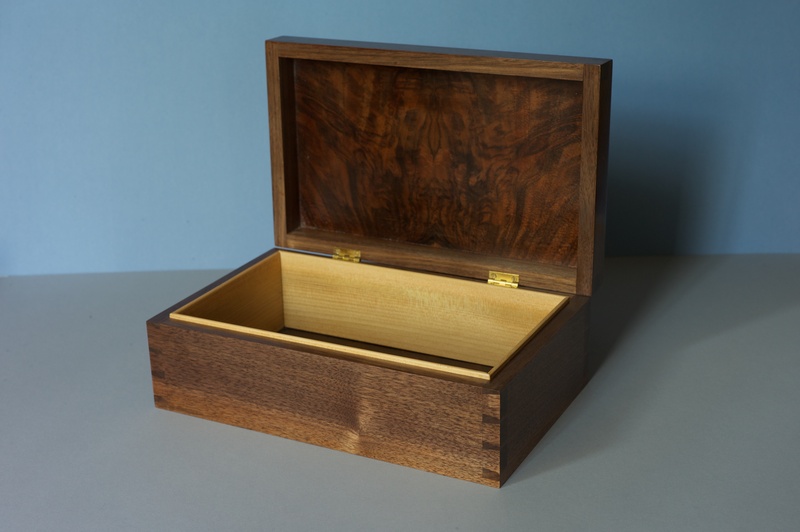 Complete with hand-cut dovetails, burr walnut and ivory wood inlay and cedar lining I hope it gives many years of pleasure, it was certainly a delight to make. Cedar of Lebanon is a stunning wood, it fills the air with a beautiful floral fragrance every time the box is opened. Check out that rich burr walnut, you can almost make out faces in the book matching. The inlay was particularly tricky, hand cut and matched into the walnut top, I wanted to create a feeling of depth and texture, almost like a full moon in a night sky or something more abstract. Well with all the festivities behind and a solid understanding of the basics I approach the second term where we undertake more substantial furniture, a table and chair no less. I have decided to make a console table in english oak with a drawer and box wood in-lay lining. Last week was spent designing a table from scratch, it is fantastic to be finally putting ideas onto paper and working through the technical drawing to see if its actually possible. I will be tracking the development of the table from design, wood selection through to the making and final polishing.